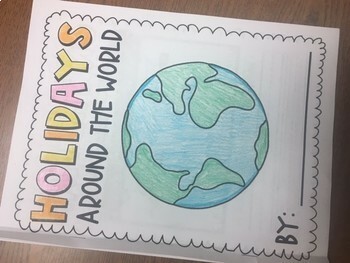 This Holidays Around the World Booklet is a great resource to learn quick facts about other countries and their cultures and traditions. Each page includes quick facts and a way for students to interact with the booklet (including finish the sentence, coloring, and a discussion question within the booklet--each page includes t least one of these). 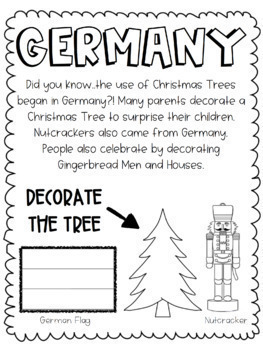 This resource would be great on its own or a great way to pair reading and writing (in this resource) with other things like hands-on activities (examples: taste testing, videos for each country discussed, or STEM-- to build Christmas Trees, boxes, etc.). This resource also includes a map and is a great tool to introduce where students live and basic geography! Holidays discussed within this booklet include: Christmas, Boxing Day, Diwali, and Las Posadas. 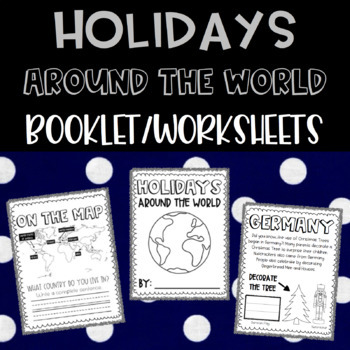 In addition to the 5 countries with their own page, the beginning of the booklet includes the Title Page "Holidays Around the World" and the first page, which includes a map that has all of the included countries labeled on it as well as the United States. 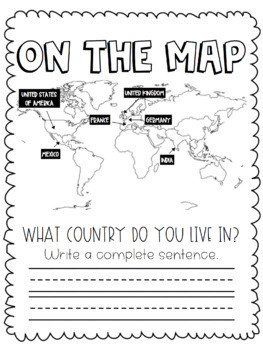 On the first page within the booklet, students answer the question: "What country do you live in? Write a complete sentence."